In his fascinating, closely argued book ‘In Search of the Irish Dreamtime’ (Thames and Hudson, 2016) archaeologist and linguist J P Mallory examines the suggestion that Irish mythological cycles preserve some memories and practices of the Irish Bronze or Iron Ages. He concludes (spoiler alert!) that there is little or no evidence for this - and that early medieval clerks mostly back-projected legends on to these highly visible, mysterious monuments. Newgrange, for example, appears in the Tochmarc Étaine (The Wooing of Étaine) as the palace of Oengus foster-son of Midir, ‘king of the elf-mounds of Ireland’, but of course the mound was never any kind of palace. There is however one suggestive detail. 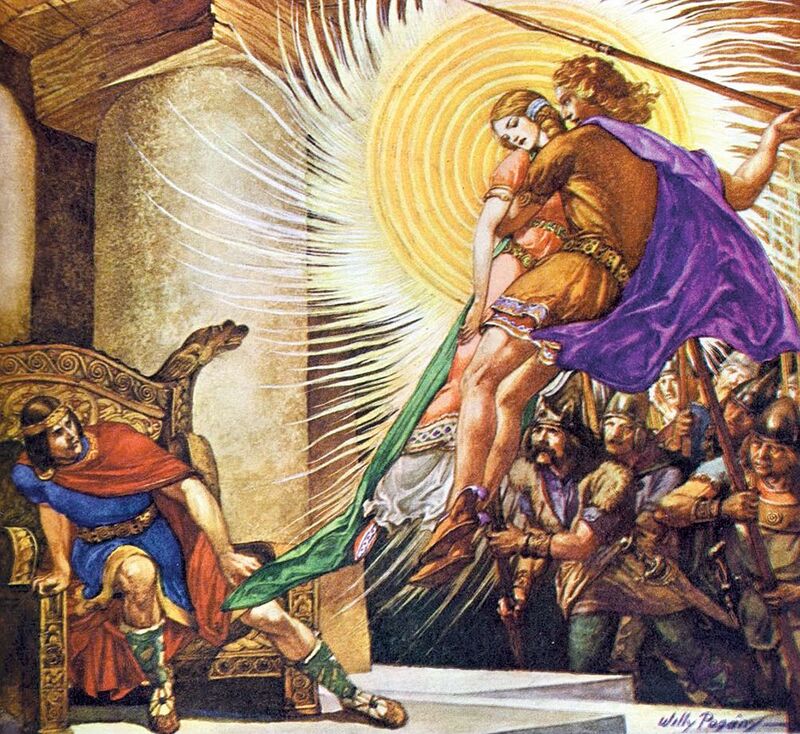 Midir, this prince of the Sidhe, comes to Bru na Bóinne to ask his foster-son for a gift, and Oengus offers him the most beautiful woman in Ireland, Étain, for his wife. The story soon becomes very complicated: Midir’s original wife Fúamnach is understandably jealous. She transforms Étain into a purple, singing fly which lives for a thousand years before falling into a cup of wine, where it is swallowed by another woman who subsequently gives birth to Étain Mk II. (The accidental swallowing of small living things - insects or worms or even grains of wheat - causing pregnancy and birth or rebirth, is a recurrent theme in Celtic mythology.) The reborn Étain is then married to Eochaid king of Tara, and the immortal Midir, still in love with her, has to perform a number of what might well be termed Herculean tasks in order to win permission from Eochaid to embrace her. One of these tasks is to build a causeway over a bog called Móin Lamraige which no one had ever been able to cross. ¶7] Then Eochaid commanded his steward to watch the effort they put forth in making the causeway. The steward went into the bog. It seemed to him as though all the men in the world from sunrise to sunset had come to the bog. They all made one mound of their clothes, and Midir went up on that mound. Into the bottom of the causeway they kept putting a forest with its trunks and roots, Midir standing and urging on the host on every side. One would think that below him all the men of the world were raising a tumult. 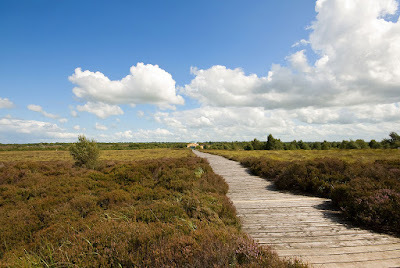 ¶8] After that, clay and gravel and stones are placed upon the bog. Now until that night the men of Ireland used to put the strain on the foreheads of oxen, (but) it was seen that the folk of the elfmounds were putting it on their shoulders. Eochaid did the same, hence he is called Eochaid Airem - or ploughman - for he was the first of the men of Ireland to put a yoke upon the necks of oxen. And these were the words that were on the lips of the host as they were making the causeway: ‘Put in hand, throw in hand, excellent oxen, in the hours after sundown; overhard is the exaction; none knoweth whose is the gain, whose the loss, from the causeway over Móin Lámraige.’ There had been no better causeway in the world, had not a watch been set on them. … Thereafter the steward came to Eochaid and brings tidings of the vast work he had witnessed, and he said there was not on the ridge of the world a magic power that surpassed it. 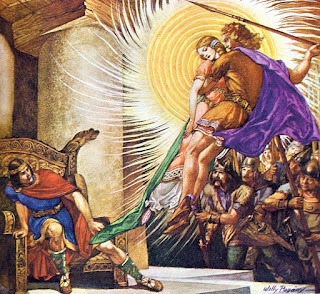 Oh, you might like to know that the love story of Étain and Midir ends happily - for them, if not for poor King Eochaid. When Midir finally succeeds in holding Etain in his arms, the two of them fly up through the rooflight in the shape of two white swans.